When I got home from work last night, I made some coffee. My darling husband came home about the same time. The following is a true and accurate representation of the conversation we had while I made coffee and talked to him. Joe: It was good, how about yours? Joe: I had an interesting start to the morning, though. Joe: Well, I went downstairs to go to the bathroom but someone forgot to flush the toilet. Could we clear the room? Not you, Frau. Not you, Scott. Not you, henchman arbitrarily turning knobs. 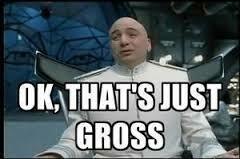 ﻿﻿ Me: That’s just gross. Was it Number One or Number Two? Joe: Whichever one poop is. He wasn’t even trying to make me laugh, but somehow watching the absolute outrage on his face was enough to make me laugh pretty much all night long. 2 Responses to "Whichever one is Number Two." My two boys are so bad about that 🙂 They only flush about 3/4th of the time. I'm not sure what's worse, forgetting to flush, or forgetting to tell the next unlucky person that there's no more toilet paper in that bathroom?